I know it shouldn't but it still does feel strange to play the games where the main focus is on the hidden object levels in stead of the typical combination of the adventure, hidden object searches, and all kinds of mini-games. 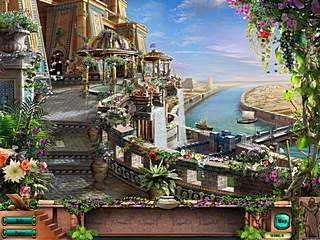 Hanging Gardens of Babylon focuses more on the hide-and-seek levels. There is one thing about the mini-games that you would notice right away. In this game you go back to the anciant story of a Babilonian king and his wife. There is some history involved. You meet the characters in that moment when the king went to fight with the enemies while the queen is literally locked in the kingdom with the people who didn't go to the battle. She is tired of waiting and wants to actually do something. So you join her as she begins her own journey. The game does have a wanering part. But it is pretty simple in the way it works. You usually just need to open a door or do something simple like that. The mini-games are a part of your journey. They are pretty easy and not challenging. There is one thing about the mini-games that you would notice right away. They don't tell you right away what to do, and you need to press the Help button in order to learn that. The hidden object levels are all over the place. They are not extremely challenging, but you do get a penalty for the wrong clicks. That penalty is for the points that you get for the hidden object searches. There are also hints for you on a rechargable basis. The game is not super polished but it still better than many of the genre. If you do love the hidden object levels, you might enjoy the game. The rest might want to try the free version first. 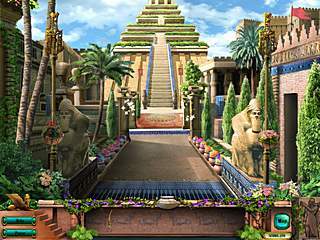 This is Hanging Gardens of Babylon review. Download this game here.